The Jr. B Elora Mohawks lacrosse team received a warm welcome to the Arthur Recreation Complex last Saturday as they teamed up with #GetInTouchForHutch to raise awareness of youth mental health and funds for the Walk so Kids Can Talk event supporting Kids Help Phone in Owen Sound on May 3. A portion of the $2,800 raised at the Mohawks games went to the walk as well as #GetInTouchForHutch. 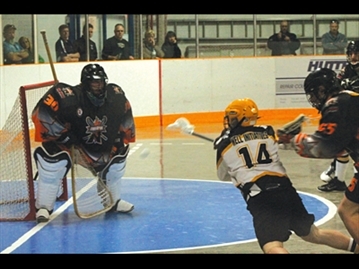 The Mohawks held their own and took an 8-6 win over the Owen Sound Northstars. The Mohawk boys did not disappoint the packed arena scoring just over a minute into the game. Goal scored by Cole Spear, assisted by Mckinley Ceaser and Jared Bouwman. The Northstars answered with a goal of their own before the Mohawks scored four more goals throughout the first period. Uninterrupted by the Northstars, goals scored by Kurtis Woodland, assisted by Cody Stannard, Mike Cavanaugh, Cavanaugh, assisted by Stannard, Klayton Hoelscher, Josh Rex, assisted by Woodland, Spear, and Spear, assisted by Woodland and Rex. Five minutes into the second period and Northstars took advantage of a power play and scored before the Mohawks did the same. Goal scored by Cavanaugh, assisted by Mason Noble and goalie Matt Humphrey. The Northstars ended the second period with a shorthanded unassisted goal to make the score 6-3 for the Mohawks. Each team put the ball in the net within a minute into the final period. Mohawks unassisted goal was scored by Stannard 31 seconds in. Both teams fought hard into the third period, but it was not enough that the Northstars out scored the Mohawks by one. Northstars scored three compared to Elora’s two goals. Second goal scored by Rex, assisted by Woodland and Hoelscher.